CHICKEN FETTUCCINE BAKE – Filled to the brim with Alfredo sauce, tossed with chicken, bacon & sun-dried tomatoes, ready in just 45 minutes. Heat oven to 350. Spray baking dish; square 8x8 or oval dish, with cooking spray. Cook pasta as directed and drain. Melt butter in a saucepan over medium heat. Stir in flour. Gradually stir in broth. Heat to boiling, stirring constantly; remove from heat. Stir in half-and-half and 1/2 cup grated parmesan cheese. Stir in chicken, tomatoes and bacon. Add pasta to chicken mixture; toss gently to mix well. Spoon into baking dish. Sprinkle with 3 tablespoons of parmesan cheese. Bake uncovered about 30 minutes or until hot in the center. 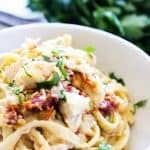 I double this recipe every time and then set aside a small portion to go dish for a friend that has 2-4 people in their family that may need a quick meal.